Our one-stop Starnet Reclamation Program is an environmentally friendly service that takes the hassles out of responsible disposal. It’s flexible enough to accept and recycle virtually all carpet materials. With one call, we’ll take care of the entire process, from removal to compliance to certification. First, we’ll put together a comprehensive quote, with no hidden expenses. Our trained staff will remove the old flooring quickly and professionally. Then we’ll arrange transportation to our dedicated recycling center and provide proof that the material did not go to a landfill. Once we get the old carpet to our recycling center, we bring it back to life in the form of new “green” flooring products, consumer and industrial parts, or convert it into energy. In fact, no useful part of the old floor goes to waste. Finally, we’ll document the procedure and submit records for compliance. Because our program is LEED compliant, it can be used for LEED accreditation. It also works within the green initiatives set forth by the Carpet America Recovery Effort (CARE). Request this document and we will send it to the email which you specify. How much of a difference does the Starnet Reclamation Program really make? We’re saving landfill space as well as reducing water use, energy use and greenhouse gas emissions. 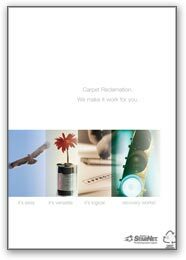 Visit our Online Carpet Reclamation Tracker to see just how much carpet we’ve reclaimed and the impact it has on our environment.